Hasil Camera CCTV Clear, bersih dan jelas, tidak ada garis-garis, sangat sangat memuaskan. 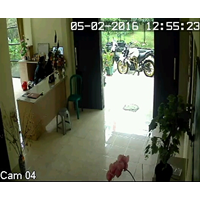 Hasil ini juga membuktikan kualitas kerja Kami yang telah berpengalaman cukup lama menghadapi berbagai masalah Camera CCTV. Dengan harga yang terjangkau murah, Kami menjamin Bapak/Ibu tidak akan menyesal telah memilih product Kami. Ini terbukti, 100% Customer yang memilih dan memasang Product Kami tidak menyesal dan merasa puas. Buat Permintaan Untuk "Camera CCTV"
Sleek in design and innovative in function, the EntryPass Networked MiNi-2 (n-MiNi2) out-performs many of its rivals in the same class. 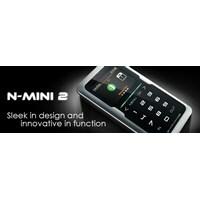 The n-MiNi2 is the next generation, high-reliability, high-efficiency and fully integrated dual applications controller with integrated reader, display and keypad targeted for various physical access control deployment with a card capacity of 30,000 users and 80,000 event memory.The device has been engineered with dual operational modes for intelligent physical access control that allows fast authentication and dependency of online server; and a time clock which reduced the cost of implementation that conventionally required 2 devices to achieve. With a touch of a button on the device, user may switch the operational mode freely when they see fit.Made to endure tough aspects of the environment like dust, moisture and water, it embodies a fast touch-enabled keypad and was designed to minimize wear and tear with a unique scratch-resistant layer.Dynamic Storage Allocation (DSA)DSA empowers you to modify the factory preset card holder and event storage database whenever necessary for personalized configurations.Dual Operation Mode (DOM)n-MiNi2 provides an extremely easy reconfiguration method via the controller default operation mode. An operation mode controls the functionality of the controller to a specific application environment. 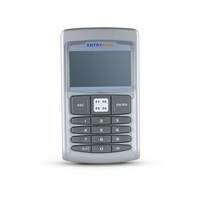 By default, n-MiNi2 support dual-application environment, namely physical door access control and advanced time clock.Switching to a new mode is as easy as a click of a button with the EntryPass Platform1 Server application. This function allows your distributor to streamline their inventory without keeping various hardware in stock.Secured Network Connectivityn-MiNi2 features an embedded ethernet port with 128bits AES encryption for connectivity up to 100mbps. In addition, the embedded Ethernet port comes with dual-sensing capability which gives it an edge of self-adoptability to lower speed network like 10mbps automatically.To enhance the data quality into the control panel, the embedded RJ45 Ethernet port also has a built-in Pulse Width Transformer to reduce data noise from the network that could affect data quality.Active Event TransmissionRather than keeping the event transaction in the memory waiting for the host server to poll, n-MiNi2 actively transmit the event back as it occurs. Comparing the conventional polling architecture, this asynchronous communication reduces the bandwidth requirement significantly when operating over the network.Both host server and n-MiNi2 actively monitors the network connectivity in between, any failure between the host server and n-MiNi2 shall trigger an alert, prompting immediate action.Peer-To-Peer Global AntipassbackSimilar to peer-to-peer (P2P) technology that adopts network communication without the need for central coordination instances (the host server), your Card holder location status are distributed among the controller as it happens, updates are fired to the group controller member in the first instance, a total of 16 controller can be added to the same group to achieve global antipassback control.Built-In Web Configuration PageThe built-in web configuration page is accessible through any compatible Internet browser (Internet Explorer recommended). For enhanced security, once the initial IP configuration is completed through the web configuration page, the web page cannot be accessed again. 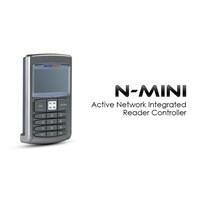 If a configuration error is made, a reset to factory default must be performed.Reader Output Control3rd party reader which comes with visual (reader’s LED / audio reader’s buzzer) feedback can now be controlled by the n-MiNi2 on any ongoing access events(enter or exit of the access controlled door). Our reader comes with tamper monitoring capability; whereby it’s monitored and automatically alerts the system once tampered to prompt further action by your system administrators.Multi-Bits / Proprietary FormatWorking with proprietary format is no longer a nightmare. 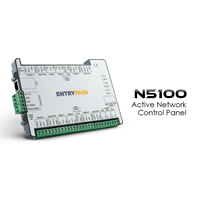 Together, EntryPass Platform1 Server application and n-MiNi2 provides a flexible way for system integrator to work with proprietary card format with ease. A visual tool from within the server application allows you to reconfigure the way a proprietary card should be read and process by the n-MiNi2 wiegand inputs.Door Interlocking *N-MiNi2 provides up to 2 variations of door interlocking, otherwise known as mantrap.In-Board Interlocking HCB with 4 readers is able to do internal 2 doors interlocking within the control panel itself, no external wiring is needed for this type of implementation. Door status being updated internally between the 2 doors before a valid access is granted. Door access is denied if another door is opened by other event.Cross-Board Interlocking Cross-board Interlocking is achievable by checking the interlocking signal from the second HCB before granting the accessibility to the local request (valid card read, request-to-exit button pressed). When a remote door status is open, local door opening is incapable. Vice versa.Configurable Inputn-MiNi2 features 4 user configurable Digital / Supervised input through the paired DRB. Each of such is configurable for various functions like door sensor, request-to-exit button and fire signal input. Depending on the application, system administrator can now freely assign the role of each input for appropriate usage.Event Based Triggering (EBT) **Base on event types occurred within the controller (for example valid card flashed, door left open, security off etc), system administrator can now freely configure the available output to react on certain event type.User CountingWith this feature, system administrator can easily configure the controller to allow a specific amount of card holders that can enter a restricted area.Firmware Upgrade Over EthernetUpgrading firmware is now a simple and convenient process to all n-MiNi2 based controller. Latest firmware will be made available via our website whereby your system administrators can freely download the firmware updates.